Harvard University Press, 9780674021495, 367pp. Between 1875 and 1920, Chicago's homicide rate more than quadrupled, making it the most violent major urban center in the United States--or, in the words of Lincoln Steffens, "first in violence, deepest in dirt." In many ways, however, Chicago became more orderly as it grew. Hundreds of thousands of newcomers poured into the city, yet levels of disorder fell and rates of drunkenness, brawling, and accidental death dropped. But if Chicagoans became less volatile and less impulsive, they also became more homicidal. 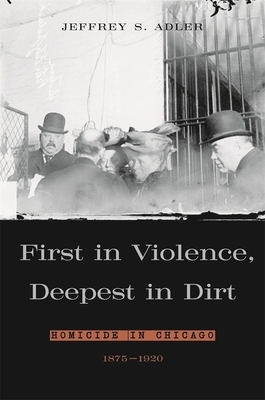 Based on an analysis of nearly six thousand homicide cases, First in Violence, Deepest in Dirt examines the ways in which industrialization, immigration, poverty, ethnic and racial conflict, and powerful cultural forces reshaped city life and generated soaring levels of lethal violence. Drawing on suicide notes, deathbed declarations, courtroom testimony, and commutation petitions, Jeffrey Adler reveals the pressures fueling murders in turn-of-the-century Chicago. During this era Chicagoans confronted social and cultural pressures powerful enough to trigger surging levels of spouse killing and fatal robberies. Homicide shifted from the swaggering rituals of plebeian masculinity into family life and then into street life. From rage killers to the "Baby Bandit Quartet," Adler offers a dramatic portrait of Chicago during a period in which the characteristic elements of modern homicide in America emerged.